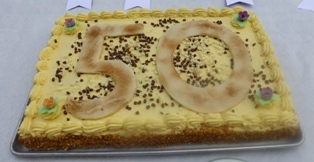 The English Apple Man has been in France joining '50th anniversary celebrations and looking at new varieties of apples & pears. On Tuesday The English Apple Man took the Shuttle from Folkstone to Calais; from Calais we drove to Villers-Cotterets in Picardy where John Breach and Bruno Essner were celebrating a 50 year alliance between the nursery business created by Charles Andre and John's first encounter with Charles when he went to work in the nursery back in 1966. 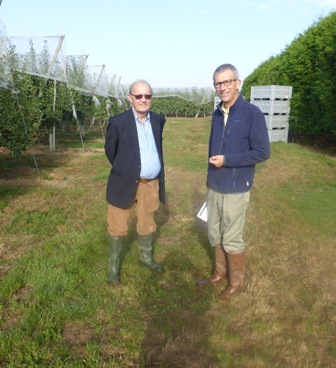 With me on the visit; Andrew Tinsley a good friend and recently retired from the AHDB, now supporting Avalon Produce Ltd in the search for potential new apple and pear varieties. Villers Cotterets was the birthplace of the author Alexandre Dumas, who created The Count of Monte Cristo, The Three Musketeers and many other literary masterpieces. 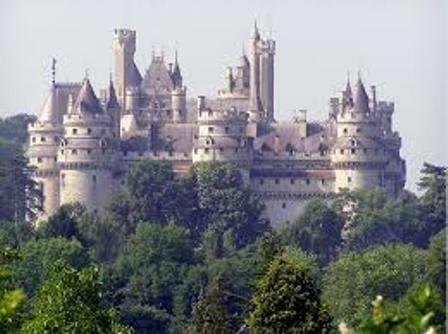 After a smooth drive into Picardie driving through the Forests around Compiegne and passing the majestic Castle at Pierrefonds; see Chateau de Pierrefonds we arrived in Villers-Cotterets just befor 4pm (French time). 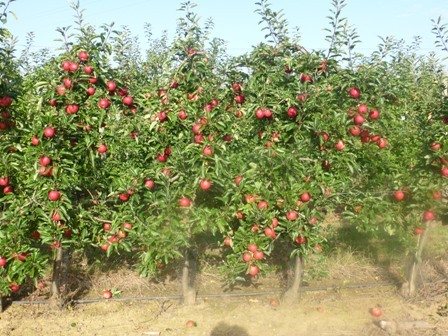 DALIVAL produces 5 million rootstocks annually and 5 million apple & pear trees. 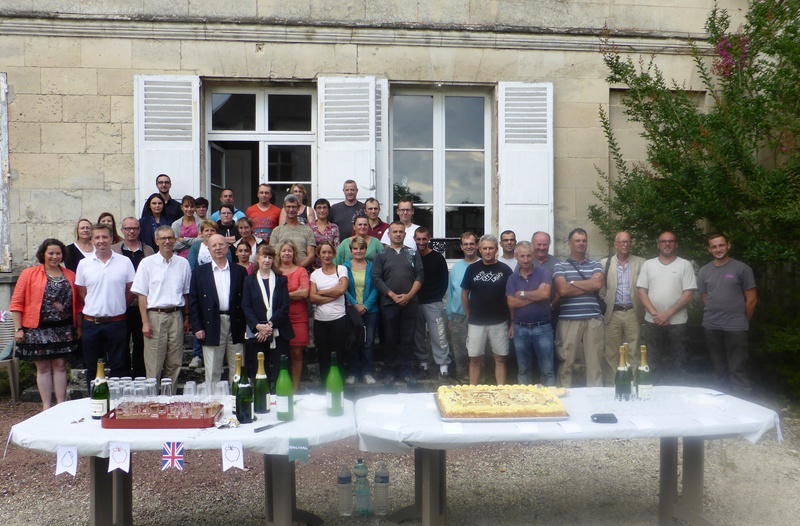 The management team at Chateau du Noue; see link to Valois Management Team are part of 130+ permanent staff employed by DALIVAL. 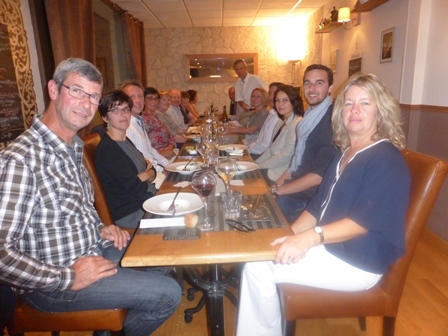 Earlier John Breach hosted a celebratory lunch in Villers Cotteret with his family in appreciation of Valois, Bruno, and members of the Valois team. One of John's memories of his days at Valois learning the 'propagation skills' from Charles Andre was his mode of transport from his parents home in England; he would drive his Mini Cooper to Lyd Airport where the service to Le Touquet included carrying his Mini across the channel before he drove down to Villers Cotterets. Originally named Lydd Ferryfield, it is now also known as London Ashford Airport, although it is over 73 miles from central London, and the name officially refers only to its operator. The airport is operated by London Ashford Airport Ltd. Lydd Airport, opened in 1954, was the first airport to be built in the UK following the end of the Second World War. It was built for Silver City Airways as an all-weather replacement operating base to that of nearby Lympne Airport, whose grass runway was often waterlogged in rainy weather. 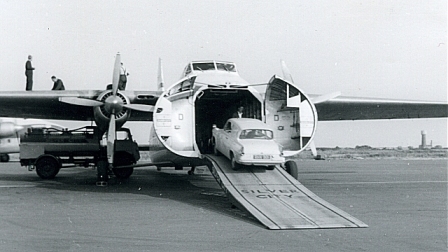 The new Lydd Ferryfield was, like Lympne, used initially for car carrying air ferry services using Bristol Freighters, operating principally to Le Touquet in France. 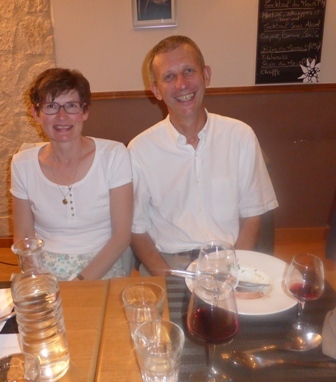 The working week at Valois included Saturday morning, but by working late (overtime) ploughing, John gained enough hours to exempt him from a Saturday morning 'once a month' allowing a visit home via Le Touquet & Lyd 'carrying a month's dirty washing under his arm' - before returning late on Sunday afternoon via Lyd/Le Touquet. 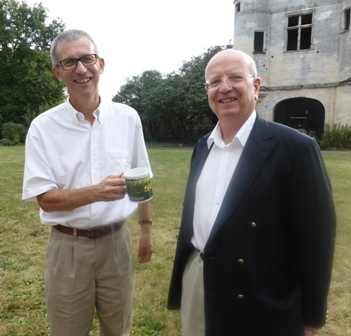 The inspirational event which triggered John becoming an agent for importing trees from Charles Andre at Pepenieres du Valois came while John was working at the nursery. Golden Delicious; due to restrictions on imports (pre-common market) were making circa 2 shillings (10 new pence) a lb compared to English Cox prices of 1 shilling and sixpence (7.5 new pence) a lb. 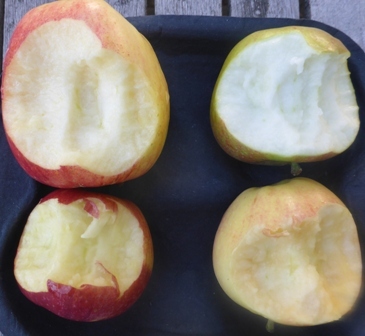 The English Apple Man Comments: "It all changed dramatically once we entered the common market in 1973" - my memory of the first Golden Delicious grown on our farm at Hawkhurst made 14p lb in 1972 but dropped to 5p lb in 1973 when import quotas were removed. 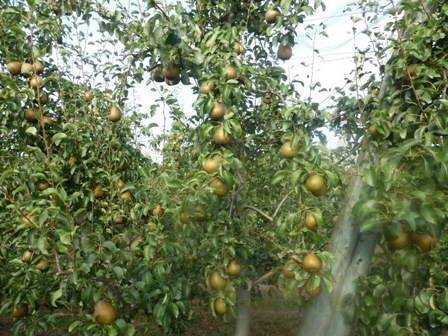 One October the nursery had 1,000 Golden Delicious trees spare and John suggested to his father that they should 'import' the trees and plant them on the farm at Staplehurst. His father said, 'he only had room for a few hundred and certainly not 1,000 trees' but John persuaded his Dad to ring around the neighbours with a view to each taking some trees. Eventually they agreed and John set off just before Christmas in the farm Citroen Van with the trees on board; at Dover he had to deal with Customs regarding the duty on imported trees. 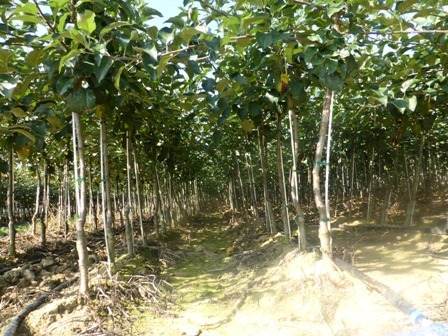 A few bundles of trees were taken to a set of scales and weighed and an import duty agreed. The trees were 'booked' to the Breach Farm Account and this was the forerunner to a lorry load of trees the next year. From these modest beginnings; J.R.Breach was born! 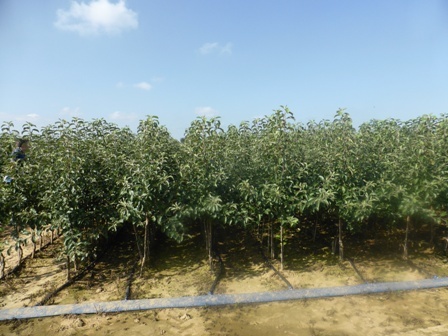 One of the varieties already in commercial use is Jugala, a new sport of Gala characterised by its earlier picking date (5 to 6 days earlier than the standard Gala) and its better fruit size. The colour is similar to Gala Galaxy. 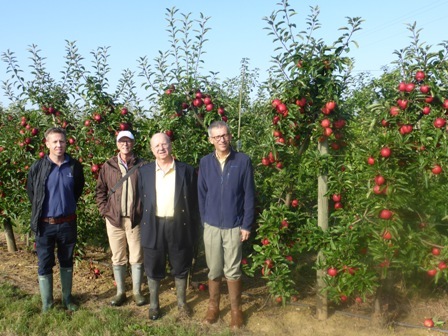 After our tour of the trial orchard, we moved on to one of the Nurseries. 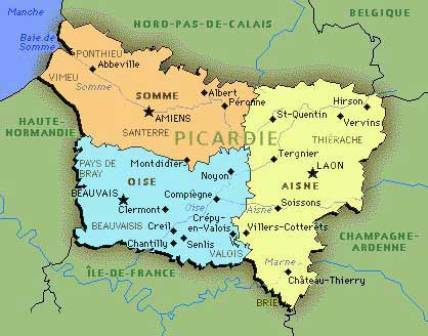 The policy at Valois is to only use land which has never grown apples before; this is facilitated by Pepinieres du Valois located well away from other orchards and nurseries; the area is very much an arable region. 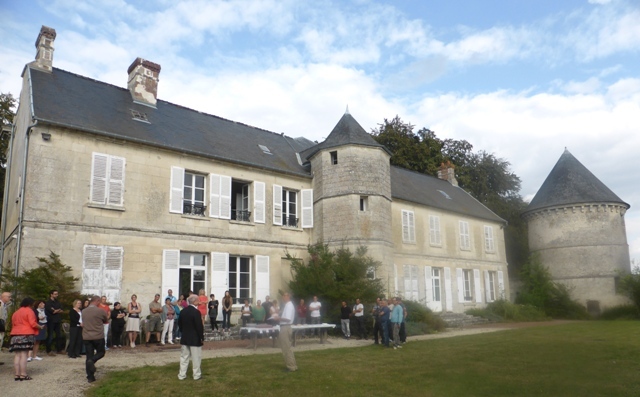 However the policy means the Nursery land continues to be located further and further away from the business headquarters at Chateau de Noue. 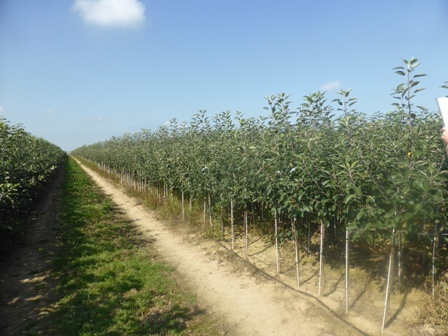 The quality of the trees in the nursery is 'stunning' with ample well formed 'feathers' (young branches) and leaders reaching 2 metres high. 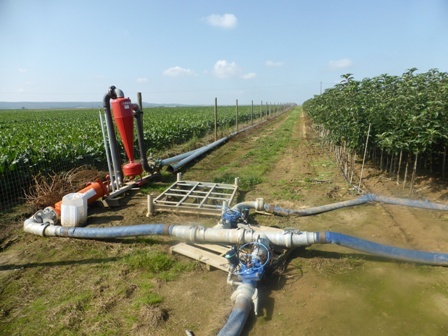 Bruno told us that all their nurseries now have irrigation; a positive factor in the development of high quality young trees. We returned from Villers Cotterets after lunch and caught the 7.20pm shuttle out of Calais - 'once again not a single migrant spotted' en-route. 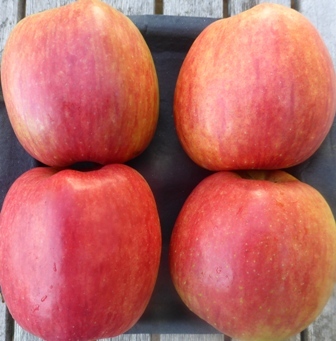 'New season' English apples are now increasingly appearing on Supermarket shelves. 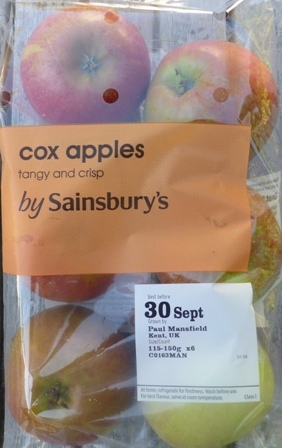 Discovery has been & gone - Worcester Pearmain, Early Windsor, Zari and now Cox are available. 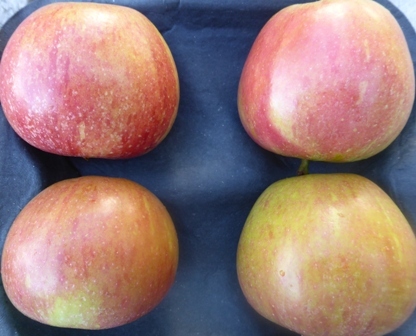 The English Apple Man bought Zari and Cox in Sainsburys yesterday (Thursday) and compared them with Gala bought in 'Carrefour' in France on Wednesday. 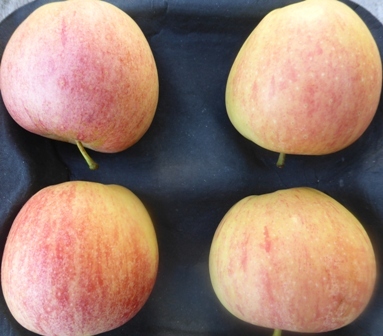 Visually; the ZARI looked superb - the COX has fair colour; 'the lack of cold nights has led to slow colouration on Cox this year - the French Gala bought in Carrefour in Villers Cotterets and grown in Provence has very weak colour, probably due to the lack of 'day/night' temperature contrast. Possibly also a poor coloured Gala clone. Eating samples of the Zari, Cox, French Gala and a Gala grown in northern Italy, the Zari was sweeter than the others and had a creamy coloured flesh; the Cox typical of an 'early harvested specimen' with distinctive acid/sweet balance and white flesh; the French Gala had the softest texture and not much flavour; the Italian Gala had good crisp juicy texture and sweet flavour with a white/cream flesh colour.